Review: Does Dr. Paul's Piggy Paste Toenail Fungus Treatment Work? You are here: Home / Foot Care Blog / Toenail Fungus Treatments / Toenail Fungus Treatment Review: What Is Dr. Paul's Piggy Paste? August 30, 2013 /0 Comments/in Toenail Fungus Treatments /by Jenn F.
America is desperate for a quick, easy, affordable toenail fungus treatment that works. Unfortunately, every toenail fungus solution out there has its set of drawbacks. Rather than pay the high cost of laser toenail treatment, wait around to see if toenail lacquer works or risk liver complications from oral medication, many people are looking for home remedies for toenail fungus or over-the-counter cures. 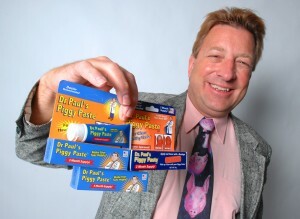 Dr. Paul’s Piggy Paste was recently featured in a FOX Small Business spotlight. What Is Dr. Paul’s Piggy Paste? Dr. Paul’s Piggy Paste was developed by Dr. Paul Kinsinger of Washington, Illinois in 2010 as a “safe and effective treatment for toenail fungus.” The family doctor said he’d read a medical journal article that pitched nine months of vinegar foot soaks as a possible cure for toenail fungus. Yet, he knew patients wouldn’t be able to stick to such a lengthy course of treatment. “People were hungry for a product that works,” he told Pantagraph News. So, using the penetrating gels he used to deliver medications to hospice patients, he worked with a local compounding pharmacy to devise a concentrated batch of vinegar and thymol (an active ingredient in mouthwash) and tested his product on 110 patients — having them apply a pea-sized amount of the paste to the cuticle and covering with a bandage for at least two hours a day. Of the 110, it cleared up 81 patients’ toenails within three to four months. He began selling his product locally, with 5,000 tubes flying off the shelves within the first four months. He has since branched out to distribute through Duane Reade, Walgreens, Wal-Mart, CVS, Rite Aid and Amazon. He hopes to get his product into more stores and run a clinical trial. Dr. Kinsinger, who runs Illini Family Medicine with his brother in Washington, said word-of-mouth is always a challenge when it comes to toenail fungus remedies because it’s a common problem that no one likes to discuss with friends and relatives. He says the benefit of Piggy Paste is that it does not interfere with any other medications. Dr. Carl Cortese, a podiatrist with Cortese Foot and Ankle Clinic, told Pantagraph Piggy Paste does contain antifungal properties. “I don’t think this is going to hurt anybody. It probably could work,” he said. Dr. Cortese added that this remedy for toenail fungus is probably best reserved for minor cases. More aggressive types of nail fungus should be treated with laser toenail treatment. However, nearly every reviewer admits that, while the product will clear the nail somewhat and improve its appearance, it does take time to see results. Many reviewers said that the product made the skin surrounding the nail red and irritated, and some users had to discontinue the product based on this adverse side effect. Sixteen reviewers at Amazon.com give Dr. Paul’s Piggy Paste 3.5/5 stars. Those who like it say they began noticing results in a few weeks and more dramatic recovery in six weeks. Some people who suffered recurring bouts of foot fungus for 10 years say this product was an important step in their treatment, while others say the product was recommended by their pharmacists. One reviewer who gave the product one star said the paste led to chemical burn and blisters. Other people said it was a “bother” to have to apply the paste and a Band-aid to each and every toe on a daily basis. One reviewer states that the “three month supply” refers to one toenail, so much more product is needed to treat multiple toes. Alas, there is still no magic bullet. For $15, Dr. Paul’s Piggy Paste might be a start — especially if your toenail fungus is in the very early stages and affects just one nail. It’s not recommended by the National Nail Fungus Organization, but we’re not sure that really matters. What does matter is that you take a comprehensive approach to eliminate toenail fungus. Wash the feet daily and dry between the toes. Add healthy antifungal foods into your diet. Get laser treatment for stubborn nail fungus. And use a SteriShoe UV shoe sanitizer daily to kill off fungal spores that remain in your footwear.